#F-01C Floor Overlaminate is (8mil), matte transparent thick PVC film with a raised, skid-resistant, deep textured surface. It is coated with acrylic pressure-sensitive adhesive on one side. This unique film is particularly suitable to protect digital prints used as floor graphics. Its rough structured surface brings to the printed image the high slip resistance from abrasion due to pedestrian traffic. It is a (8mil) clear matt monomeric rigid PVC. (6mil) is optional. Eliminating glare and providing a unique slip resistant finish. Has a high tack adhesive compatible with digital inkjet inks such as solvent, eco-solvent, Latex ink. Backing liner: Siliconized paper liner. 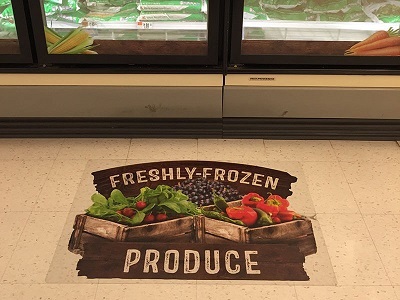 Anti-slippery protection of floor graphics. Indoor or outdoor application with cold lamination.